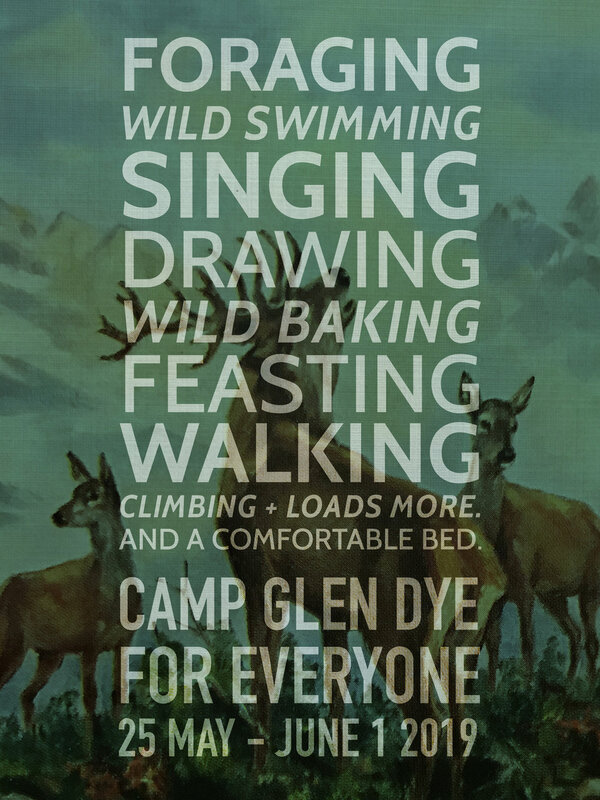 The idea is to offer a week’s accommodation in the Glen Dye cabins and cottages (as well as some camping) and, simultaneously, to offer several engaging activities each day that guests can enjoy if they so wish. AMAZING ACCOMMODATION! WONDERFUL LOCATION! FABULOUS SPEAKERS AND INSPIRATIONAL TEACHERS! NEW FRIENDS! FUN AND LEARNING! There will be something for everyone but no one has to do anything other than relax, should they so wish. This will be a sort of mini festival -or perhaps even summer camp- that you can dip in and out of as you wish. It is aimed at all ages with a maximum of approximately 30 guests so that everyone will forge close connections with the speakers and instructors. It will be intimate and incredibly friendly and -we think- quite unlike anything else in Britain. All of the activities below are included in the prices quoted. That’s at least 20 events, one dinner, some drinks and some amazing accommodation for an all in price. Alex Gregory MBE won Olympic golds in rowing in 2012 and 2016. He has recently written Dadventures which is ‘the ultimate family activity guide for busy daring dads in need of a little inspiration to spend quality time with their kids’. Alex will speak on his career in rowing and will also lead a couple of outdoor sessions aimed at all ages and probably including some swimming in the River Dye. Jorge Fernandez and Dee Rettali. Jorge was the co founder and head chef of London’s much-loved café chain Fernandez and Wells. Dee Rettali is a baker and together they have recently launched a new project, The Fortitude Bakehouse with the aim of preserving ‘traditional crafts and time honoured baking methods.’ Jorge and Dee will run a series of classes demonstrating how to cook and bake on open fires. James Sills is a community choir master and folk musician. His aim is to get people singing. In 2019 James will publish his first book for the Do Book Co. He has lectured far and wide including a recent stint in the US. James will be talk on the value of singing, he will sing and he’ll create the first ever Glen Dye choir. Alec Farmer, founder of Glasgow’s Trakke Bags, will talk on the ups and downs of creating a brand dedicated to making products that are proudly British. Charlie and Caroline Gladstone are the founders and owners of The Glen Dye Cabins and Cottages as well as of Pedlars and The Good Life Experience. Charlie is planning to record an episode of his well-loved podcast The Mavericks in front of a small audience. Caroline will demonstrate some outdoor cooking techniques. A guided walk with Archie Dykes, retired gamekeeper and resident of Glen Dye for over 45 years. Calligraphy and nature drawing classes with Mel Shand, local artists and Artist in Residence at The Good Life Experience 2018. Running and morning exercise classes with local trainers Fay and Lee Jordan of Trail Tribe. Guided foraging walks with Natasha Lloyd (medicinal herbalist and forager for The Fife Arms in Braemar). An outdoor dinner of pizzas using the locally foraged and sourced ingredients cooked by Glen Dye resident Pauline Roger in her wood-fired pizza van. A talk and concert by Paul Anderson, one of the most widely known and respected exponents of the Scottish fiddle tradition. And there are more good things to come. *Although all speakers etc are confirmed at the time of writing, the programme is subject to change. No 4 Steading Cottage. Shared accommodation with secure bedrooms. £385 per person; includes all accommodation for seven nights, all activities (approx. 20), one dinner, welcome pack and more. Two doubles, one twin and one single room available. Shared kitchen, sitting room, bathrooms. Accommodation includes shared access to hot tub, Big Green Egg etc. North Lodge. Sleeps six people. Charge of £2310 for six people; includes all accommodation for seven nights, all activities (approx. 20), one dinner, welcome pack and more. £385 per person. Accommodation includes river side cabin, hot tub, Big Green Egg etc. No 5 Steading Cottage. Shared accommodation with secure bedrooms. £385 per person; includes all accommodation for seven nights, all activities (approx. 20), one dinner, welcome pack and more. Two doubles, one twin, and one single room available. Two people per room. Shared kitchen, sitting room, bathrooms. Accommodation includes shared access to hot tub, Big Green Egg etc. Saw Mill Airstream. Sleeps two people in large double. Charge of £770 for two people; includes shared access to indoor kitchen and sitting room, outdoor kitchen with Big Green Egg, pizza oven etc, indoor shower and loo, outdoor shower and outdoor hot tub. Bell Tents with Camp Beds. Numbers very limited. Two person £670. Four person £1340. Includes all accommodation for seven nights, all activities (approx. 20), one dinner, welcome pack and more. Accommodation includes shared access to indoor kitchen and sitting room, outdoor kitchen with Big Green Egg, pizza oven etc, indoor shower and loo, outdoor shower and hot tub. Bring your own tent. Numbers very limited. £295 per person; camping pitch for seven nights, all activities (approx. 20), one dinner, welcome pack and more. Accommodation includes shared access to indoor kitchen and sitting room, outdoor kitchen with Big Green Egg, pizza oven etc, indoor shower and loo, outdoor shower and hot tub.